If a cat is contented or happy, he will be pay attention to what goes on in his home. He may want to just observe, or he may want to get involved, but he will certainly pay attention to life around him. Some cats choose to just supervise, and others get more involved. When you cat encounters someone new in your home, he should be alert, but not fearful if he is in an overall state of happiness. He is able to be comfortable and confident in his home. He shows with his body how he is feeling. Think of his overall body, then the discrete elements. 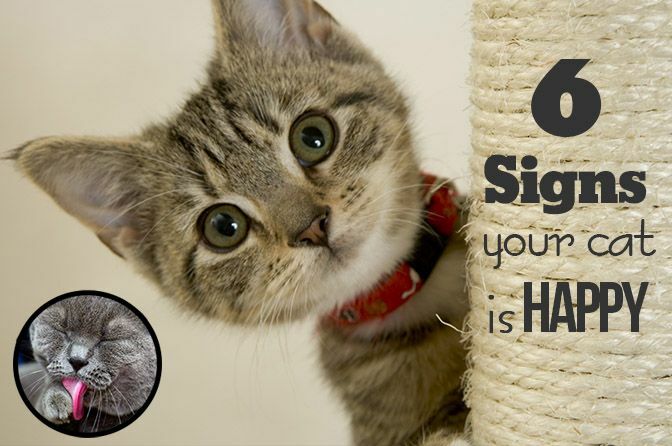 Your cat uses his eyes, ears, tail and entire body to communicate with you. When a cat is happy, his eyes may be part way shut, you may see slow blinking, his ears are alert and forward facing. When he sits or lays, he relaxes and tucks his paws under himself, a sign of comfort and confidence. He won’t feel the need to puff up his fur to make himself appear larger and more intimidating if he is comfortable and feeling safe. When he saunters or even plays, his tail will tend to be held uprightly, which is a way that he indicates greeting to those around him. When you think of how your cat sleeps, you will also be able to gauge his comfort level. Just like humans, when depression sets in, sleep can become a bit extreme, but for the most part, there are other cues your cat can give you. Cats in general sleep quite a lot. When your cat chooses to sleep with you or one of your other pets, you know that he feels happy in these relationships. You only sleep near those that you care about and feel comforted by, which is a good sign of happiness. Play time shows that your cat feels safe enough to let down his guard and really interact with others, whether it be other pets or you. Young cats play significantly more than older cats, but any play at all shows you that your cat is happy, even if he slows down as he gets older. Those bursts of play are a sure sign that your cat is happy in your home. Cats don’t tend to eat for comfort, as people might. A cat that is happy will be one that eats well, as he feels safe enough to consume enough without a need for being wary.Yes, your cat may want you to bring him treats, but that isn’t his primary motivation. When a cat is happy, it takes care of itself and may even groom you or other pets in the home. This is a sign of a good relationship and contentment. If your cats isn’t taking good care in his grooming habits, he may be unhappy or ill.